From the beginning of civilization, flags have been used to symbolize the principles for which nations stand. Many different flags have floated over the territory now included in the United States, the original Union Jack was here also. 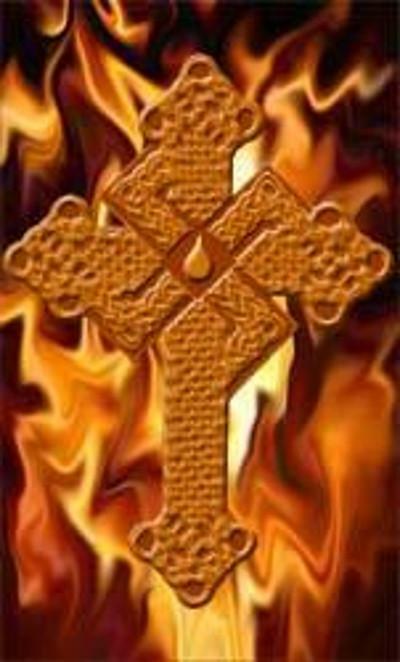 It was the red cross of St. George and with it was subjoined the white diagonal cross of St. Andrew, in a field of blue. This flag had come into being in 1606 following the union of England and Scotland three years earlier. It was not the present Union Jack of Great Britain, for the red diagonal cross on a white ground for Ireland, was not added until later. Why the diagonal crosses? Genesis chapter 48 gives us the answer. When Jacob blessed the two sons of Joseph he crossed his hands, putting his right hand on the head of Ephriam and his left on the head of Manasseh, saying that Manasseh would become a great people and Ephraim a multitude of nations. So today we have the United States and the British Commonwealth of nations, descendants of the tribe of Joseph, to whom was given the birthright. The first flag of the united colonists, the immediate predecessor of the stars and stripes, was the Grand Union flag, sometimes called the First Navy Ensign or the Cambridge flag. It was hoisted by order of General Washington on Prospect Hill in what is now Somerville, Mass., on January 1, 1776. It had the Union Jack in the canton and red and white stripes. It was a peculiar flag, the stripes standing for the union of the colonies and their revolt against the mother country. The crosses indicated an allegiance to the mother country not yet wholly broken. When reported in England it was alluded to as the thirteen rebellious stripes. This flag was never formalized by congress, but was in use until nearly a year after the declaration of independence, until it was superseded by the stars and stripes. When Vermont and Kentucky came into the union on June 1, 1792, congress soon passed an act increasing the stars and stripes on our national flag from thirteen to fifteen. This was our national banner for twenty-three years. This was the flag which inspired Francis Scott Key to write The Star Spangled Banner. Thus on July 4, 1818, the flag with 20 stars and 13 stripes appeared and then came the addition of star after star for state after state until on July 4, 1960, after the admission of Alaska and Hawaii the stars number 50. No star has ever been removed. Let’s trace our nation and our flag from their Biblical origins. As we have said so many times in these lessons, we are an Israel nation. Yahweh commanded Israel to set up standards, banners or flags, one for each tribe. Numbers 1:52Psalm 20:5 records, “in the name of our God we will set up our banners.” This we have done. says, “And the children of Israel shall pitch their tents, every man by his own standard, throughout their hosts.” Standards are referred to twenty-one times in Numbers, Isaiah, and Jeremiah. The only object ever to rest upon our national flag is the holy Bible, just as the church pennant is the only banner permitted to fly above it in the United States navy. This is clear, national recognition, of the word of Yahweh as the overruling spiritual force. We salute the flag! There are some who don’t care to pay their respects to the flag of the United States of America. They regard saluting the flag as a sign of worship, but it isn’t that. It is a sign of respect for the government for which the flag stands. Yahweh organized a government at Mt. Sinai, and to that government He gave authority to rule, instructing each tribe to encamp by its own standard, the emblem of its authority, to which respect was to be shown. The stars and stripes symbolizes these thoughts. “‘Declare ye among the nations, and publish and set up a standard; publish, and conceal not’ (Jer. 30: 2).